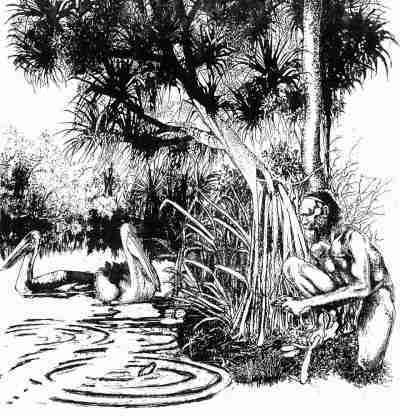 Aborigines would often traditionally hunt some quarries without any kind of aid or weapon. Pelicans, for example, could be caught by throwing mussels into the water near the birds to imitate the sound of jumping fish. The hunter remaining concealed, would gradually shorten the range of his throw bringing the bird progressively nearer, until it could be either killed with a boomerang, or even taken by hand. Sometimes the hunter would just tap the water with his hand or a stone to lure the bird towards the place where he was hidden.